If you own a buy-to-let property but had a tenant trash it when they left, then make sure you read this article because we’re covering this all-too-common problem that affects thousands of landlords every single month. Is it worth pursuing the tenant? You need to first assess the damage & repair in order to decide if it’s worth going after the tenant. Unfortunately, it often isn’t worth the hassle because it may be a time consuming and even expensive effort to get the tenant to pay you back. However, if the damage is significant enough, you may choose to do this. If you do make sure you have sufficient patience and capital for legal fees and drawn out court appearances. Is it worth fixing the damage? One little-known option that is actually really helpful is to find a handyman who wants to rent the house. 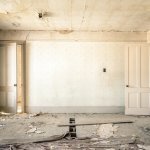 In exchange for a discount on rent (or even free rent) they can fix up the house for you to make it a nice rental property again. This means you may have some cash coming in on a consistent basis without having to do fork out on a significant refurbishment bill. However, make sure you have a timeline all spelled out, though, to avoid them staying too long without a lot of work getting done. Another option is to sell the house and move on from owning a frustrating and cash sapping rental property. However, be aware that if you try to sell the house on the open market, you may have to fix it up first in order for an estate agent to list it. This is especially the case if your local market is showing signs of slow and limited property sales. Another option is for you to sell privately to a house-buying team like ours. (We buy houses in as-is condition and we’ll fix them up ourselves). To get a fair cash offer for your property, no matter what condition it’s in, just get in touch with us and we’ll give you a no-obligation offer and we can even buy your property from you fast. Click here now and fill out the form or call our office at 0191 486 2386 and we’ll get back to you right away.